This fascinating title, first published in 1922, presents a detailed overview of the life and works of Shakespeare. 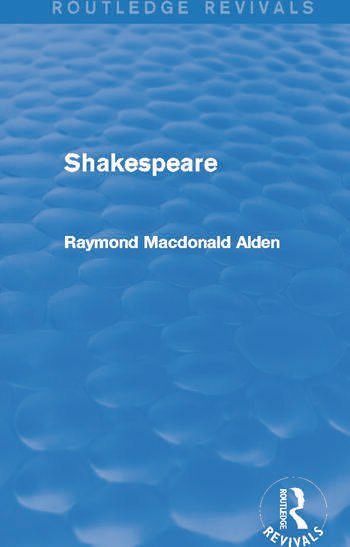 Alden first considers Shakespeare’s Elizabethan context, alongside exploring the Classical and Italian foundations, political theories, concepts and theatrical trends that influenced his works. Next, a comprehensive biography provides insight into Shakespeare’s probable education, relationships and contemporaries. The final sections are devoted to the genres into which Shakespeare’s works have been categorised, with full analyses of and backgrounds to the poems, histories, comedies and tragedies. An important study, this title will be of particular value to students in need of a comprehensive overview of Shakespeare’s life and works, as well as the more general inquisitive reader.